About 2,500 years ago, Isaiah prophesied that a book would come in that last days. The book would contain “a revelation from God, from the beginning of the world until the ending thereof” (2 Nephi 27:6-10). 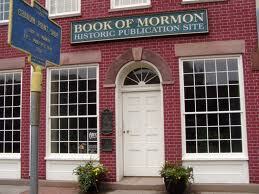 This book is the Book of Mormon. Ancient American prophets prayed that the Lord would fulfill Isaiah’s prophecy so the future readers “might be brought unto salvation” (Enos 1:13). The prophecy was fulfilled on March 26, 1830 in the sleepy little farm town of Palmyra, New York. When the translation process of the Book of Mormon was completed, Joseph Smith sought out a printer for the publication. Two printers in nearby Rochester were approached but one refused to print the book because he did not believe Joseph’s story of how the book came to be, and the other printer wanted an exorbitant price. After much persuasion, Egbert B. Grandin, a printer in Palmyra, finally agreed to take on the job. Grandin would print the 5,000 book order for $3,000. $3,000 in 1830 money is equivalent to about $70,000 in 2015 money! Joseph turned to his old friend Martin Harris for help. To the objection of his wife, Martin mortgaged his home and farm and gave the money to Joseph. The money was never repaid; Martin knew it wouldn’t be. Hyrum Smith oversaw the project. Hyrum visited the Grandin Building almost daily. For security reasons, only 24 pages of the printers manuscript (a copy of the original work) was delivered at a time. Five months into the process, a local group organized mass meetings and passed a resolution pledging themselves not to purchase the Book of Mormon. As a result, the Book of Mormon received a cold reception on March 26, 1830 when it was finally published and available for sale. One year later, Martin Harris sold his farm to pay the printer’s debt. Martin Harris is most remembered for foolishly misplacing the 116 pages of the Book of Mormon. Most don’t remember, or even know about Martin’s generous sacrifice which was the only means available for the Book of Mormon to be published. Martin was also one of the Three Witnesses. He died at the age of 92, firm in the faith, and true to his testimony of the Book of Mormon. From the small effort of Samuel Smith, one of these original Books of Mormon instilled a testimony into a family who would lead the Church for over 40 years and be responsible for bringing countless others to the gospel of Jesus Christ. Now, 185 years later, millions of people throughout the world, speaking in dozens of languages testify just as Brigham did, “I know it is true”. Want to received our latest blog? Simply sign up on the left hand side of this page.